Saturday’s proceedings at the greeny-brown lake by the Maritsa River started with a para-glider buzzing the course, continued with some surreal IOC presence in the Paddington-like form of President Bach, and came to a head with several epic A-finals in both the Paralympic and Olympic classes. The Irish made history, the Italians made further leaps up the medal table, Belgium won a rare bronze and while some had their hopes dashed, others fulfilled their destiny with ecstatic gold. 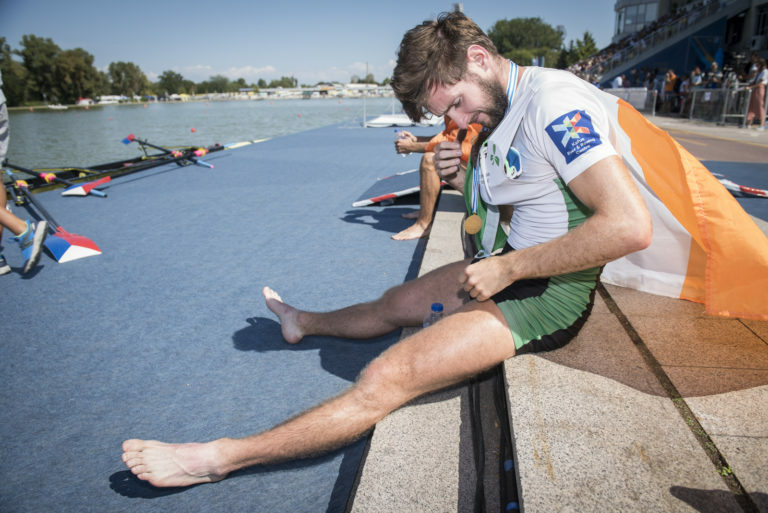 Photo Paul O’Donovan relaxes on the medal pontoons after winning historic gold in Plovdiv. Fiercely competitive B-finals started the morning, and were rounded off by the novel sight of the current Olympic gold, world gold and world silver medallists in the M4x race for places 7-12. It doesn’t take a mindreader to see that those countries who made the quads A-final will have serious targets on their backs in 2019. But in a sport where close and intense competition has become the norm in every Olympic boat category (and quite a few of the others), who won’t. Even in the women’s quads A-final, where the top four took an early lead they kept extending without positions changing, there was a tension to the race as Poland, who eventually took the gold over Germany and the Netherlands with China underperforming, chipped steadily away to pull out without every quite managing to drop their rivals. Earlier in the morning IOC President Thomas Bach, visiting Bulgaria as it conveniently hosted three separate sport world championships in one weekend (the others were volleyball and gymnastics), had met athletes, officials and national federation representatives for discussions about the future. He was carefully ushered to watch the A-finals, including two brilliant lightweight doubles races, and was diplomatic about how good everything was in a press conference later on. 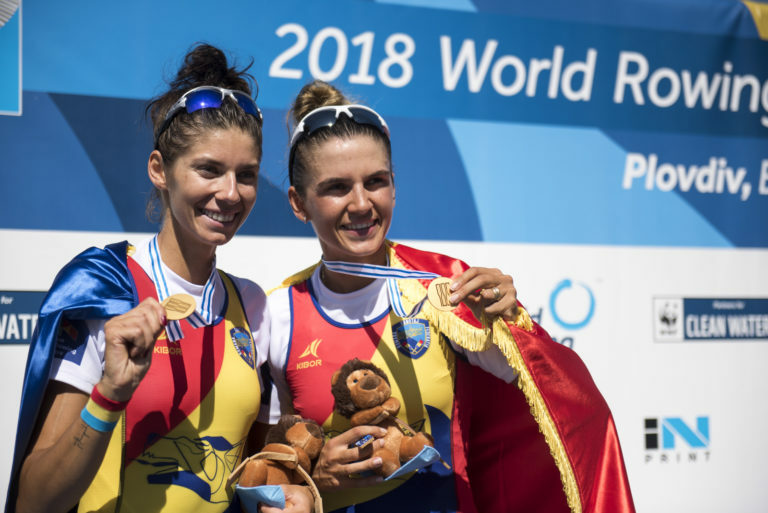 Photo Romanians Ionela-Livia Cozmiuc and Gianna-Elena Beleaga – two of only six competitors in Olympic crews who managed to successfully defend a 2017 title. The lightweights played their part in this PR exercise by delivering beautifully close competitions in both finals. Roumanians Ionela-Livia Cozmiuc and Gianna-Elena Beleaga were two of only six competitors in Olympic crews who managed to successfully defend a 2017 title, surfing the tide of a blistering lightweight doubles final to come out on top, just. The first leaders were Britain, valiantly pushing out in an unanswerably necessary strategy to try and get an edge, but even though Roumania turned the screw and moved through relatively early on, nobody was being dropped rapidly. Just as the Netherlands seemed to be finding a route past the Swiss and Brits, up came the US on a sensational charge which took them through to silver in a near-photofinish with the Dutch. Britain faded but so even more did 2017 runners-up New Zealand.After the Wednesday LM2x kerfuffle it was quite a relief to reach the medal race without any further problems. After the Wednesday LM2x kerfuffle it was quite a relief to reach the medal race without any further problems. Unfortunately before racing began Norway’s Kristoffer Brun had to drop out for medical reasons and so Are Strandli moved to bow and Jens Holm was brought in to stroke. They kept up with the race for the first half but couldn’t hold the speed and dropped back with Spain while the rest forged on. Italy kicked off the fireworks at the front with a great first thousand, but the onlookers were just waiting to see when Ireland’s O’Donovan brothers, stalking along behind, would drop the hammer. The answer was just after halfway, and a sense of inexorable power flowed out of the famous siblings, moving them past Italy as if on an express train. But Stefano Oppo and Pietro Ruta stubbornly refused to give up, making the last few hundred metres fast, furious and never quite appearing predictable until the line finally arrived. A history-making first ever Olympic-class world title for Ireland put them on the front pages of every Irish newspaper the next day, albeit with both the French and Norwegians missing from the party, but a major victory for the O’Donovans nevertheless. 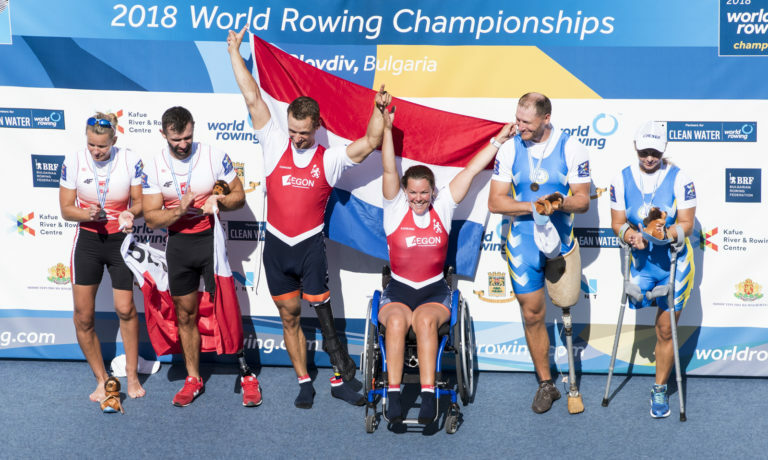 Photo Corne de Koning and Annike Van der Meer teamed up to bag the PR2 mixed double gold. Not content with PR2 singles gold and silver respectively, Corne de Koning and Annike Van der Meer teamed up to bag the PR2 mixed double gold as well, in a race which looked widely spread by the end but was surprisingly competitive early on. They were a second off a world best time in an average tail-wind — and don’t forget this is not a new boat class but a seasoned Paralympic event — and could almost certainly have broken it if pushed harder. But minutes later we were treated to an insanely competitive mixed coxed fours final, in which Britain won their eighth successive gold to consolidate the longest active winning streak, after being pushed almost to breaking point by the USA. The American para-four, including indomitable stroke Danielle Hansen who later rowed another whole flat-out final to claim an automatic gold at bow in the uncontested PR3 women’s pair, dashed off the blocks at high speed, clearly hoping to put the Brits under pressure. For a while they kept the upper hand, while Britain concentrated on settling into their best rhythm. With that as a springboard, the defending champions began their pushes before half-way, and then simply kept pushing, capping everything the US could try until they finally got their bows over the line. 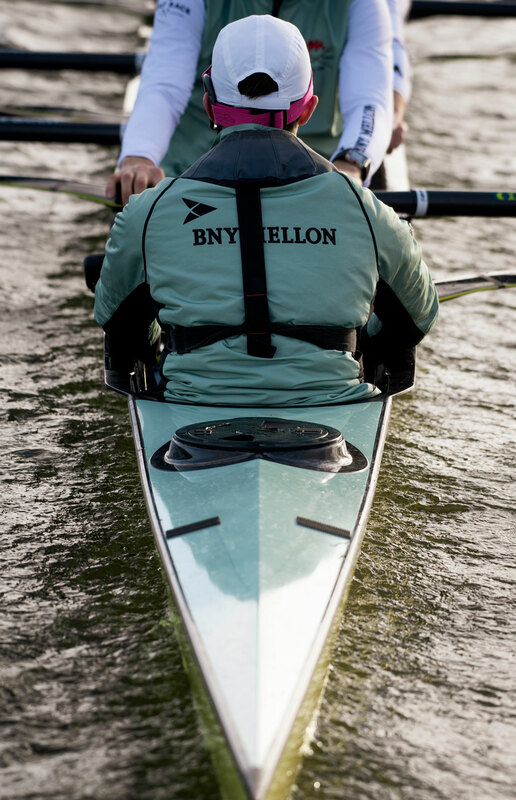 It was hard, it was brutal, there were never more than a few feet in it and because of the doubled distance, it was by far the toughest mixed coxed fours race since the boat class was invented. And given that both the GBR and USA fours intend to stay in the game until Tokyo, it could get even more interesting next year. 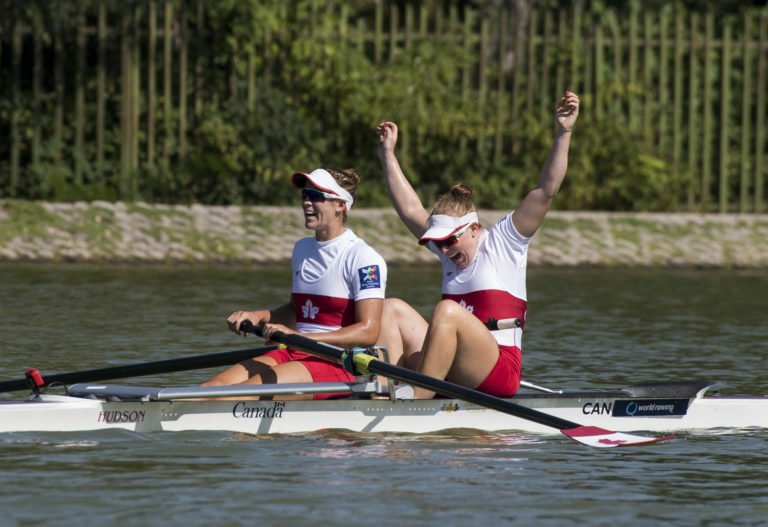 Photo The women’s pairs saw relative newcomers Caileigh Filmer and Hillary Janssens from Canada beat the New Zealand headline duo. New Zealand have shown signs of slipping off their high standards this year, with both eights in the B-finals and Kiwis losing close semi-finals. The women’s pairs saw relative newcomers Caileigh Filmer and Hillary Janssens from Canada beat the New Zealand headline duo of Grace Prendergast and Kerri Gowler for the second time this week, having given them fair warning with a blistering semi-final defeat. Nobody else got a look-in as these two barrelled towards the line lengths and lengths clear, and the message was clear: the new girls are in town. By contrast the men’s pairs, which could have been close, were a one-boat party for Croatia’s Sinkovic brothers, pulling out what may very well be their best ever race in the pair. Once the field had sorted itself out behind them, Roumanians Cozmiuc & Tudosa and the Onfroy brothers from France threw the kitchen sink at trying to overturn the Croatian lead, but despite impressively fast final sprints this time they couldn’t find a single chink in the Sinkovic armour. Sweep continued to produce epics: the women’s four ended in a hell-for-leather sprint and the US registering a deserved close victory over defending champions Australia while Russia picked up bronze. 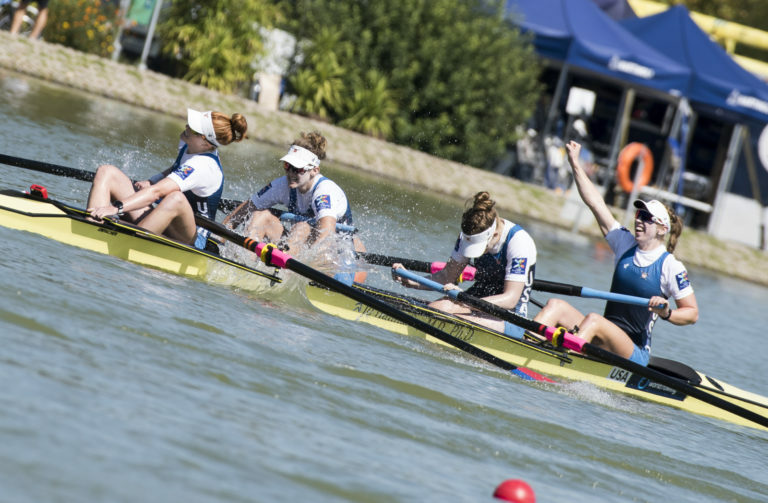 The W4- has come on a very long way since the start of its inclusion in the Olympic classes in May 2017, and fully deserves its place at the top table: the US led all the way and matched anything the Aussies could throw at them. Green and gold order was restored a race later, as the Australian men’s coxless four did manage to retain their title, at first looking as if they would do it with lordly grandeur a length ahead of the rest. Going past 1600m a switch flicked in the brains of the Italian M4- in the adjoining lane, and suddenly a brilliantly bonkers Italian sprint was in full swing, rapidly chewing up the water between them and the Aussies. The defending champions held on but only just: 0.25 seconds is nothing at this level and they were fading very fast in the last 50 metres, grimly waiting for the line. The British four, who had already won their battle against the Netherlands for bronze, also closed quickly on the leaders, while Roumania’s under-23 champions were left struggling in fifth ahead of Germany. One Australian athlete had to skip the medal ceremony, exhausted, a measure of how much had been expended to seal the win. Italy’s party went up another gear in the last race of the A-finals, when they pulled a blinder to grab the men’s quads gold from lane 1, catching everyone else unawares and hoicking them back to the top of the medal table. The sight of all six quads within a length of each other for most of the course was impressive, and although Australia had a thundering second thousand which helped them clinch the silver over Ukraine, it couldn’t quite dent the unshakeable Italian confidence. The bounciness continued into the medal ceremony, with the Italians singing their national anthem loudly and the bow-man conducting the crowd to join in.